The three movements contained in this piece (1. Murmuration; 2. Night Music; 3. Evrest) were composed over five years in the reverse order to which they appear in performance. 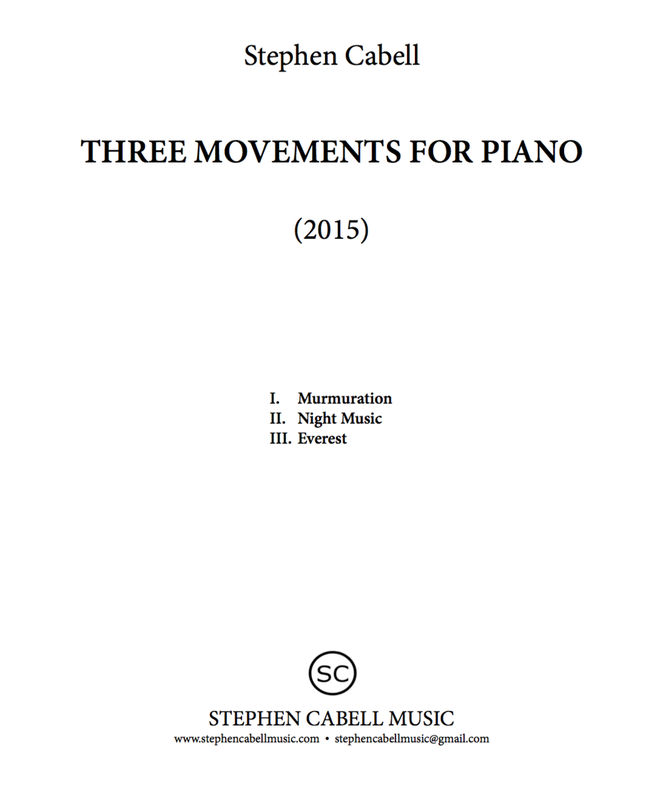 Each may be performed as a separate, intact piece or as a complete three movement whole. Though disparate in extramusical content, these three movements are connected by catalysts from the natural world. A murmuration, the word titling the first movement, is a large flock of birds, specifically starlings, commonly consisting of hundreds to thousands of individuals. Murmurations move not unlike a school of fish—reacting as a single organism. When beginning composition of the first movement, I encountered a murmuration of starlings and was mesmerized by it’s elegant and graceful undulations. In an intuitive fashion, this movement reflects on the qualities of murmurations and was complete in 2015. The second movement, NIGHT MUSIC, is bookended by an atmospheric tune designed to evoke the stillness and mystery of the night. In between is a lilting dance which evokes the youthful excitement of childhood when we were allowed to stay up past our bedtimes, especially when parents were not around. Many influences mixed while composing this piece including my memories of night time as a child, more recent memories of Maine woods at night, and the mysterious, mystical moods evoked in David Lynch’s Twin Peaks--though not the "murdery" parts. The final movement, Everest, is indeed titled after the tallest mountain on the planet. Though the sharp rising figures in the first half of the piece visually and aurally recall mountains, it is not intended to be a representation of that titular natural wonder. Rather, it is intended as a metaphor for a mammoth obstacle encountered in one’s life. Once overcome, the persister emerges on the other side transformed by the experience; just as the rising figures mutate into descending ones. This movement was completed in 2010. Much went into this work and many people helped along the way. I would like to thank David Fung, Sean Kennard, Monika Haar, Lisa Moore, Futaba Niekawa, Christopher Rouse, Sheridan Seyfried, and Alex Weiser. I would also like to express my gratitude to Kettle Corn New Music for commissioning the first movement and their support during the compositional process and premiere.